Do I Really Need to Worry About Bing? 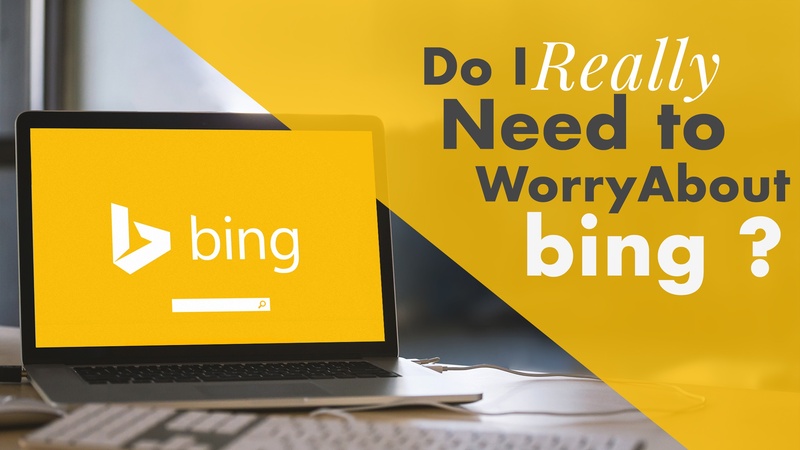 Digital Marketing: Do I Really Need to Worry About Bing? One of the first questions you usually encounters when telling somebody you’re an SEO specialist is “Oh, so you work with Google, right?” and (risking the wrath of other SEOs) this is much true…for the most part. Google is massive. We all know this. From self-driving-cars to free internet from weather balloons, these guys are outright changing the world we live in. Awesome technology aside, they’re famous for one main thing: internet search. In the early 2000s, Google.com introduced algorithmic search engine technology which revolutionised the internet entirely, so much so that 'Googling' is now in the dictionary. In fact, any marketer who has pitched SEO services to a client will agree that the term SEO (Search Engine Optimisation) is often replaceable with GO (Google Optimisation). Making Google the centre of your search marketing efforts is all well and good, but what about Bing? Are search engines other than Google worth accounting for? The short answer is yes. The above graph shows that, despite our general stylish hipsterism, Mac computers are not the norm for South Africans. With upwards of 80% OS market share, Microsoft Windows dominates in terms of desktop systems in SA. Like it or not, when people are at work (most of the time), they’re likely searching for your brand’s services using a PC. But doesn’t everybody just download Chrome? This is generally the first thing said by tech-savvy Internet Explorer deniers, and indeed, Chrome dominates the browser space in SA; but not by much. A staggering 32.82% of South African desktop users are working with Internet Explorer (a quick look at my clients’ Analytics accounts confirms 20-35% IE usage share). Surely people using Internet Explorer still use Google? BING! Their browser uses its default search protocol to make the query using Bing. “Every consumer edition of Windows 10 comes with Cortana, Microsoft's digital assistant, which is kind of like Apple's Siri with an attitude. When you ask Cortana to run a web search, it opens up in Bing.”. It's worth mentioning that the same article also states that Bing has become a $1 billion business, and in 2015 is profitable for the first time. So how do I align my content with Bing? The good news is that you are probably already aligning your content with Bing. Any SEO worth his salt is very aware of Google best-practice techniques, and keeping to these will generally also tick all the boxes required by Bing to rank content. All you need to do is make sure that your web content is properly configured with Bing Webmaster Tools. The setup here is very similar to Google Search Console in that you can verify site ownership, submit sitemaps and request new indexing for pages. Additionally, Bing (unlike Google) allows you to align your website with your social media accounts from inside their webmaster dashboard. There’s also a really cool inbound link tracker there, but that’s an article for another day. Keep doing what you’re doing in terms of Google best-practice, but always be sure to configure new content through Bing Webmaster Tools. Do this and you’re already a few steps closer to dominating organic search impression share.